Although I wrote everything I know about squirrel issues for this website, oftentimes a problem with squirrels in the attic is beyond the scope of the do-it-yourself homeowner to solve. I have found a professional company in Boca Raton, Florida that handles problems with wildlife. Centurian Wildlife has access to tools, techniques, and experience that help them do a far better job at wildlife removal than a non-experienced homeowner could. They possess licensing that allows them to do certain types of work legally, that non-licensed homeowners in the state of Florida are not allowed to do. For the welfare of your situation, and the squirrels, in some cases it's best to hire a pro. There are good companies and bad companies out there. I've done research on such companies, to get to know them, and feel confident recommending their services. I therefore recommend a company called Centurian Wildlife which services Boca Raton, Florida. If you have a squirrel problem, or any other conflict with a wild animal, and live in Boca Raton, I am confident that this company, Centurian Wildlife, is the one to call. I asked the company to describe their service range, and they said this - Our range includes Boca Raton, Boynton Beach, Delray Beach, Kings Point, Highland Beach, Coral Springs, Parkland, Coconut Creek, Deerfield Beach, and Lighthouse Point. Centurian Wildlife operates 24/7, so don't hesitate to call at any time to discuss your wildlife problem, and schedule an appointment for same-day or next-day service. Dear Dave, Thanks for dedicating the time to provide all this useful information. I know I will need to get rid of the squirrels in my attic for all reasons you mentioned but hate to think of making them homeless. Like your idea about the "nest box". We are up in Boca Raton, north of Miami, and I will contact a good company here. Thanks again, Vidya I've been trapping and relocating pest squirrels for a few days now and have been taking them about 3-4 miles away. I read on your site that 5 or even 10 is recommended. I even saw 20 miles on another site! I live in an "urban" area of a small suburb town west of Boca Raton, with lots of creeks, trees, green space, major roads, etc. I have been taking the critters out to the skirts of town. ... I just can't imagine that these guys could find their way back to my house over creeks, 4-lane highways, railroad tracks, etc ...especially since there is lots of suitable (seemingly) habitat between the drop off and my house. what do you think? Thanks! Please pardon any typos! If you have a squirrel problem in Palm Beach County Florida, or any other conflict with a wild animal, I am confident that we can solve it. 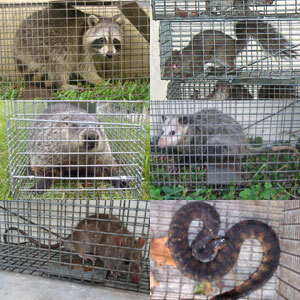 We use humane methods when dealing with Boca Raton wildlife removal situations. Squirrel Control Boca Raton. Our company is fully licensed and insured in Florida. Call us any time at 561-826-6475 for a price quote and to schedule a same-day or next-day appointment to solve your squirrel problem in Boca Raton.